Thanks to recent design changes that have decreased the size and weight, vests are becoming the increasingly popular choice in body armor for survivalists. Prior to these changes, body armor vests were too bulky or uncomfortable to consider wearing for long period of times, however now vests are the perfect choice for survivalists. How can a vest protect you in times of extreme danger? Obviously, the main purpose of a bullet proof vest is to protect the wearer from bullet related injuries. Firearms are becoming increasingly accessible, and mass shootings are a daily occurrence in America, so having a protective vest is a necessity. Vests come in a variety of designs depending on the type of bullet you wish to protect yourself from, so do your research and decide which level of protection you need. Although guns are a major weapon to protect yourself from in the near future, to survive, you’ll need protection from other weapons as well. Vests will protect your internal organs from being pierced by knifes, needles or other weapons with sharp, spiky edges. In a survival situation, guns may be hard to come by, so people may turn to using weapons that can be easily crafted or found, like the sharp objects previously mentioned. It is important to note that bullet proof vests are not designed to protect against these weapons. Despite the strength of the material, these vests will easily tear when hit with a spiked object. Survivalists must find vests that are stab and spike proof for safety. Once you find a stab and spike proof vest, you’ll be protected from the use of crossbows and bow & arrow weapons as well. Although these may be less common due to the difficulty in use, it’s always best to be prepared for any weaponry you may be attacked with. Unless thrown hard at your head, rocks will probably not cause fatal injuries, however they could cause minor injuries that make it difficult for you to defend yourself. 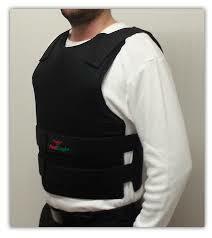 Prevent blows to the chest and internal organs by wearing a protective bullet proof vest. These vests will cushion the blows, preventing serious damage to your body. None of these attacks would be possible without people, and perhaps people pose the greatest threat of all, even without a weapon. If others cannot get their hands on weaponry, they may use their bare hands to fight you, and in this case, vests may not work in your favor. Although vests could cushion the blows that come at you, they could also work against you by slowing your down or limiting full range of motion. Because of the wide variety of threats that survivalists face, it is important to have an arsenal of body armor available to prevent as much damage as possible.